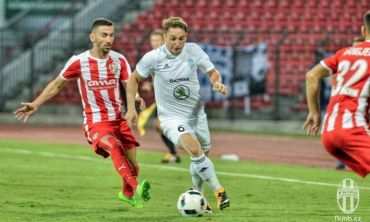 A deserved victory over the relegated Ústí was assured by Kulič and Mendy. Boleslav confirmed fifth place in the 2010/11 Gambrinus League. The Boleslav team lost five matches in a row, but in the second last round in Uherské Hradiště they collected all the points, enjoyed their victory dance in the changeroom and jumped up to fifth position. Boleslav was quickly behind in this otherwise equal match, and failed to catch up. This was the fifth league match lost in a row, and the third on home turf. Jablonec had been beaten eight times since 2007. Mladá Boleslav has beaten Viktoria Plzeň in their last four matches. It happened twice in league games (4:0 in the spring and 4:3 in the autumn), and also in this year's cup matches (home 2:1 and away 2:1). But this time they were just not up to it. Boleslav lost a match where it had more chances than their rival, namely in the second half, when Hradec hardly crossed the half-way line. Yet they lost all of the points with an inaccurate finishing game. And thus they lost their third championship match in a row. Boleslav was in the lead after only four minutes with Mendy's goal and was halfway to a victory that would have pushed it closer to third place in Gambrinus League. However, Bohemians turned the course of the game around with Nešpor scoring twice and Škoda adding one goal. The Boleslav players were a sorry sight, especially in the second half. Boleslav lost the first half when Sparta's Kweuke scored after pass from Kerič. Chramosta managed to tie the game after the break, but Boleslav cheer lasted for only two minutes. The winning goal was scored by Sionko after another pass from Kerič. The match was a straightforward fight for fifth place in the league which Boleslav could defend only by victory or draw, with Teplice falling behind by two points into sixth place. Boleslav won, and because Olomouc lost in Liberec, it actually jumped into fourth place in the Gambrinus League. Boleslav played some very good soccer on home turf, and beat their formidable opponent from Olomouc by two goals. The attractive match was played at a fast pace and the home team deservedly took the resulting three points.